Mattresses and box springs often cost over a thousand dollars, with a cheap frame under it. It's no wonder they loosen or break. Antique bed frames are built better than their contemporary counterparts, but attrition effects them similarly. Bed frames absorb a tremendous amount of punishment, but if they can't handle it, they're easy to repair with a few simple materials. 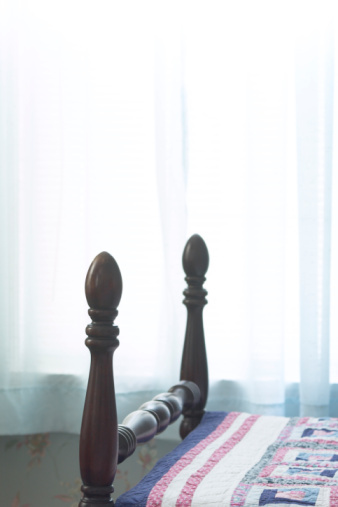 Cracks and splits, one of the most common problems, develop if the bed frame doesn't have adequate support. The split is typically along horizontal grain lines on either side, or at either end of the frame. Fix it with glue, clamps and some scrap wood. Remove the mattress and box springs. Leave the slats in place. Insert a screwdriver into the crack from the inside of the frame and pry it open slightly. Clean out splinters or chips as needed with a utility knife. Using the tip of a glue bottle, inject glue the length of the split. Use the thin blade of a putty knife, to smear the glue, saturating the inside of the crack. Place bar clamps across the frame and tighten until glue oozes out the length of the crack. C-clamps are another option, but they don't have the power of a bar clamp. Allow the clamps to remain on the frame overnight. Measure the length of the split on the inside and add 6 inches. Measure the width of the frame. Use a table, or miter saw to cut a strip of 1/2-inch plywood -- almost any type of scrap wood will suffice -- to the measurements. Pre-drill the scrap piece with a 3/16-inch bit and drill/driver, randomly placing the holes about 2 inches apart. Stagger the screw holes so they don't line up with each other. Apply an even layer of wood glue to one side of the scrap plywood. Place it over the split on the inside. Drive 1-inch screws through the plywood using the pilot holes. Allow the frame to dry overnight before using the bed. Mortise and tenon joints typically used on antique beds can loosen, and are sometimes reinforced with metal brackets, or the frame may have had brackets installed when it was new. Repair them by removing the brackets, repairing the joint, and replacing the brackets. Using a drill/driver, unscrew the screws that hold the metal brackets to the frame. The metal brackets are folded, 90-degree pieces of metal located on each corner on the inside of the frame. If your bed has brackets, they will be screwed on over the mortise and tenon joint. Check the joints. Mortise and tenon joints look like a square block on one piece, inserted into a slot on an adjoining piece. If they're loose, use a rubber mallet to tap them apart. Scrape off any dried glue with a chisel. If they're not loose, don't take them apart. Measure the tenon. Use scissors to cut two pieces of wood tape. Glue the wood tape to the tenon to give it more width. If the joint is excessively sloppy use two pieces of wood tape, one on each side of the tenon. Apply glue liberally to the slot that receives the tenon. Reassemble the frame, using the rubber mallet if needed to pound it back together. Reposition the brackets, so that the holes from the old screws don't match up with the existing holes in the brackets. Screw the brackets on using the original screws. If they're stripped, use new screws of the same length. Replace defective slats, or slats that are too short with new ones. Drill a 3/16-inch pilot hole in the ends, and screw the slats on using 1 1/4-inch screws -- one for each end of the slat -- if they don't already have screws. For even more security, add a drop of glue to each slat. If you can't find a real problem with the frame, but the bed obviously sags, the issue might be with the box springs. Manufacturers often place cheap lumber around the perimeter at the bottom of the box. Wider beds typically have a center rail as well. If it cracks or breaks, the bed sags in the middle. Remedy the problem by cutting 3/4-by-2-inch pine strips. Pre-drill and screw them around the perimeter at the bottom, with a 4-inch piece screwed to the center rail for extra support. Don't worry about the thin mesh covering on the bottom, just screw the pieces on over it.